I love it! I hope you will keep blogging in to your pregnancy! This all sounds so familiar yet feels like it was a long time ago! I actually loved the attention from strangers and the way Tash, our Golden, would follow me around protectively. You’re almost there doll; so excited for you guys! Thanks Melinda 🙂 I love the dog attention too, just cracks me up. The strangers… I don’t know, I think I’m a bit shy! Definitely getting excited though! I’m so excited for you – I just loved reading about your pregnancy and love your writing and sense of humor. Hang in there my friend. I miss your face!!! Thanks Marcia– I miss your face too!! Oh boy. 3rd Trimester. That’s when your legs, ankles, back & everything start to feel like you’re carrying around a 400 pound walrus. Good luck & the dog’s paw on your tummy is adorable. Haha, yes, true to all of the above, thank you!! Yay for this post! 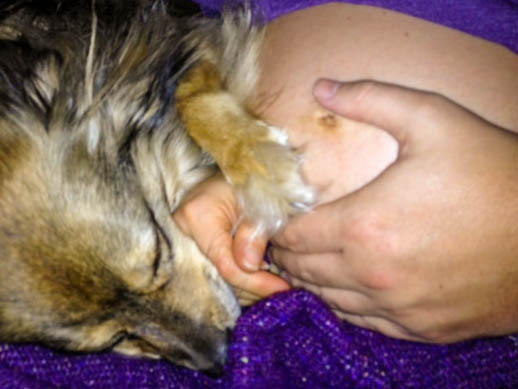 Loved the imagery of the pups thinking you are the messiah and using your belly as a pillow. Can’t wait to see and hear more about the journey. Love you friend!! I knew you’d love the pups part 😉 Really took that pic to email you but then ended up finding it useful for this post! Can’t wait to see you soon! So much love! +1 for the Seinfeld reference! I was fortunate, my wife was a very happy pregnant woman, but she did get to the point where she just wanted it to be over. Marvelous post, I hope you’re well, and good luck! Thanks Jeffo, it’s definitely an adventure I find humorous! Glad to hear things went so smoothly for your wife! Aww. I’m so happy for you. It was great of you to check in and share with us.